Birds of a Feather is a portrait series of live birds ranging from the common Parakeet to the exotic Hyacinth Macaw. 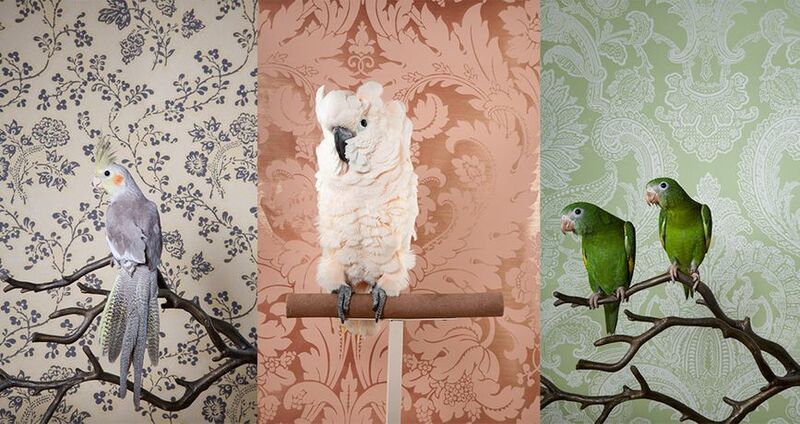 The birds are photographed against complementary vintage and historical reproduction wallpaper to encourage optical illusion and visual blending. The birds mirror the careful, self-conscious poses of humans in a comical and unexpected way. Posed, the birds anthropomorphize as we attribute human emotion and intent to their expressions. Aviary collecting, display and a general fascination with the natural world, especially the exotic, came into fashion during the Victorian era in Europe. The Industrial Revolution created a disconnect from nature. A rise in colonization and exploration yielded an awareness of faraway places, amazing creatures and unfamiliar cultures. This series references that traditional desire to posses the beautiful and exotic but by removing it from it’s natural environment it is changed forever.